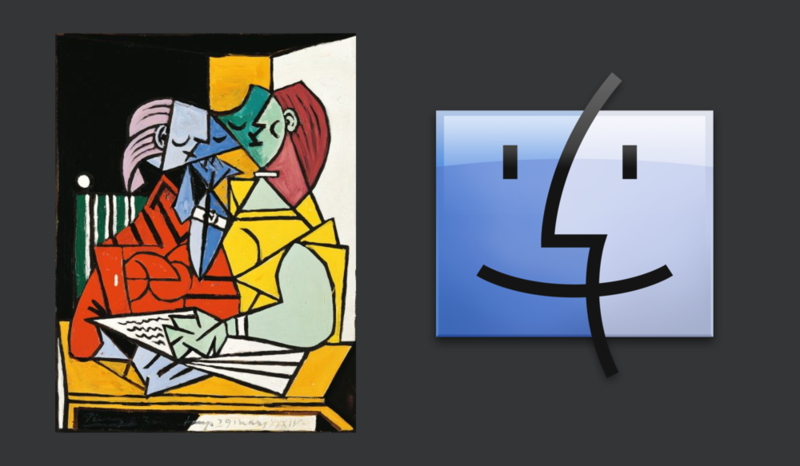 Picasso's Two Characters (1934) is referenced in Apple's OS X Finder icon. This is the second installment of the Humanist Interface book. If you've missed it, be sure to read the Introduction. The movement of modern minimalism, while stronger than ever in the design of digital interfaces, is not remotely a new phenomenon. It has endured in earnest for over a century. Though a somewhat diverse movement as a whole, its practitioners maintain the common goal of reducing everything to the abstract and conceptual world of words. As with any movement, many, if not most of its adherents simply go with the tide and follow aesthetic trends without any more than the most surface-level knowledge of their complicity. Twentieth-century modern minimalism is found throughout modern operating systems. Consider the reference of Picasso's Two Characters (1934) in the OS X Finder icon. Almost a century after its creation, Picasso's modernist work still holds relevance for interface designers. Oskar Schlemmer's Bauhaus Emblem (1922) provided inspiration for Susan Kare's Macintosh notification icon (1984). La Gerbe by Matisse (1953) and Macintosh advertising (1984). It was long thought that the early Macintosh drawings by Tom Hughes and John Casado (1984) were inspired by Picasso, but it has been revealed that they were in fact inspired by works including La Gerbe (1953) by the 'expert' modern minimalist Henri Matisse. Picasso, Bull Lithographs (1945). Apple uses this particular modern minimalist piece in their internal trainings for designers. The name of the training in reduction is, "What Makes Apple, Apple." Those in positions of leadership in the community are undoubtedly aware of the history and dangers of modern minimalism, and press forward nonetheless. For many years, Apple has paid homage to its modernist forbearers. Indeed, at internal trainings, employees are presented with the works of Pablo Picasso, in order that they be inculcated in the tradition of radical reduction. The New York Times described these trainings as imparting Apple's "religious" belief in the practice of subtractive minimalism. Picasso's own descriptions of his art are instructive: “A picture used to be a sum of additions. In my case a picture is a sum of destructions.” No practitioner today could have better described modern interface design. 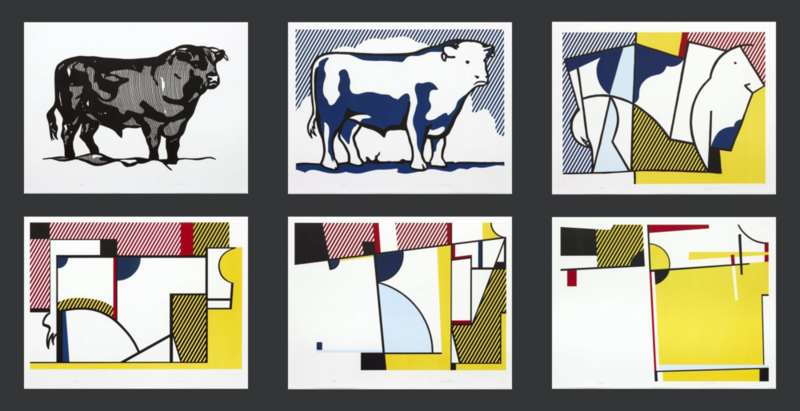 Roy Lichtenstein, Bull I-VI (1973). These paintings were influenced by both Picasso and van Doesburg. De Stijl painter Piet Mondrian produced Composition with Red, Yellow, and Blue in 1921. His work had an immense impact on design thought. Notice the similarity to the original Windows Logo and the aesthetic of Windows Modern. Microsoft’s design language, Windows Modern, is eerily similar to the paintings of Mondrian. Its abstract world of flat colored planes and typography has lost all sense of connection to anything meaningful or concrete. These deliberately obscure design choices often leave users without any way to discern the function of interface elements. This is a highly exaggerated illustration of flat design shadows – made in 3D of course, because how else would one render shadows in a "flat" world? In practice, Material Design shadows are much less realistic than this. Google too describes their Material Design language as "modern," with each interface element "reduced to its minimal form, with every idea edited to its essence." If nothing else, it is highly ironic that in a design language called "Material" it is forbidden to render anything other than shadows with dimensional realism. But the fact that Google's use of dropshadows is seen as a radical departure from the norm speaks clearly to the agreement of all major operating system vendors on the project of modern minimalism. There is much to learn from the now-dominant ideology of reduction. Particularly what, at its roots, makes modern minimalism so seductive to compel an entire industry to follow in its footsteps without looking back. Take a look at the third installment of the Humanist Interface book: The Mental Model.